Backpackers Hostel is centrally located in Kingston, Jamaica and near all major attractions. Also on the property is a Cafe/Bar and Art Gallery which means you can experience the Jamaican culture right here at the hostel. We also offer tours with a local tour guide to the major attractions in Kingston and Jamaica. The Airport is 30 minutes away. Bob Marley Museum is 10 minutes away. Port Royal/Lime Cay is 40 minutes away. Half Way Tree and New Kingston are 15 minutes away. Blue Mountain and Holywell are 1 hour away. Devon House is 10 minutes away. National Art Gallery is 20 minutes away. Backpackers Hostel is a small hostel with 10 beds located in a garden setting. Free Parking, Free WiFi and Free Lockers. 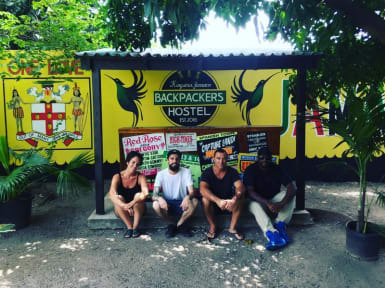 Our friendly staff look forward to making your stay as enjoyable as possible and we hope to see you at Backpackers Hostel! Breakfast is available but not included. Zach is the Man. The owner went out of his way to provide everything I needed before I knew I needed it. Great location. Had a live on property staff 24 hours. The location was great @ Manor Park (w/ food, bistro's, groceries, & warm neighborhood.) With the 2 greatest attributes were the location (near taxis & buses) and the Vibe of the property was so amazing & relaxed. Clean, friendly, & comfortable. If your in Kingston, and your a backpacker (retired, student, or group) you have to stay here. Great place in a good location 5km north of downtown. Friendly staff, good culture, very helpful. Shops very close, bus stop too, great food close. Fans in rooms no air con, shower was cold water only, lockers for security, clean beds and towels, pillows. The hostel is a bit outside of the city but the bus stops right in front of the hostel (100 dollars from downtown, which is like 0.85 USD). There are a lot of stores and restaurants nearby. The place has a nice garden, hammock, bar with drinks and snacks. Lockers are free of charge. Room and restroom is clean, well maintained, no broken stuff. WiFi works fine and fast. Staff is really cool and friendly. Would be nice to have a small kitchen or at least some cups, plates and cutlery. Great location, close to supermarkets, restaurants and Halfway tree station, so its easy to get to and from the airport and other atractions by public transport, bedrooms and beds are clean and comfortable, the garden and common are nice to relax and take a drink. The owner is kind and helpful, but there's at night, and the front gate remains opened. Perfect choice for backpacking community. Good for budget vacations. Close to restaurants, shopping and public transport. As backpackers who has slept in a lot of different places, this was the worst experience! We e-mailed if it was okay, we cheked in later because of our flight, and they agreed. When we arrived the place was all dark, and the guy didn’t know we should come. Our beds wasn’t made from earlier, and he couldn’t help with anything. Hope it works better when you arrive in day time! Only good thing is a cafe on the other side of the road.